RECOGNITION of the Unified Examination Certificate (UEC) from Chinese independent schools has been a long-standing issue in the chapters of the country’s education landscape. With a 40-odd-year history, recognition of the UEC has again taken the spotlight with its inclusion in the Pakatan Harapan Manifesto in the 14th General Election. The issue is to enable UEC holders to gain admission into the country’s public universities as well as public service, which has eluded them thus far. To thoroughly understand the matter, and its impact and effects, the Education Ministry set up a task force last September to study the recognition of the UEC. Headed by Eddin Khoo Bu Eng, founder of the Centre for the Study and Documentation of Traditional Malay Performances, the panel of three includes Muslim Youth Movement of Malaysia president Mohamad Raimi Ab Rahim and Malaysia-China Chamber of Commerce president as well as vice-president of the United Chinese School Committees Association of Malaysia, otherwise known as Dong Zong, Datuk Tan Yew Sing. In a recent interview with NST, Khoo said that although the issue over UEC had been going on for the last four decades, this is the first time a committee has been established to study the matter independently. “Our job is to address this issue and provide recommendations to the government. We are not the ones who are making the decisions but as a result of our study, we will give suggestions. We have determined our methodology freely and we have agreed that the most in depth way (to carry out this study) is to get in touch with each party with a stand,” he added. Since November last year, the task force has actively gathered views and feedback from various stakeholders and has up till Press time interviewed some 56 individuals and entities including associations, political parties, scholars and parents for their opinions on the issue. From the task force’s interactions with the stakeholders so far, it has observed that there are two stands with differing dimensions on the matter: to those who support the recognition of UEC, it is the issue of execution and administration. “For them, if this administrative issue is resolved, there is no barrier to having UEC recognised,” said Khoo. To those who are against recognition, their stance is mainly rooted in an abstract issue that is equally important — the status of the national language, national unity and national issues. While each stand must be recognised and respected, he said some of these standings are not based on educated processes and reflection on the issue so the interview process became dedicated towards gaining insight into the more in-depth issues. “In most of our discussions, we ended up not focusing on just the UEC issue but more of viewing the matter in the bigger education context—national schools’ issues, lack of confidence in the national education system, education democratisation which already began to take place 20 years ago, parents’ choice and their view of the future of their children in a changing world,” said Khoo, adding that no one rejects the Malay language as the national language. “All these have to be taken into question… no one side is totally right and no one side is totally wrong. Some have the view that if there are many systems or streams, which already exist, they will strain unity. But some argue that diversity is important — it affirms choices, allows you to decide what is best for your child. 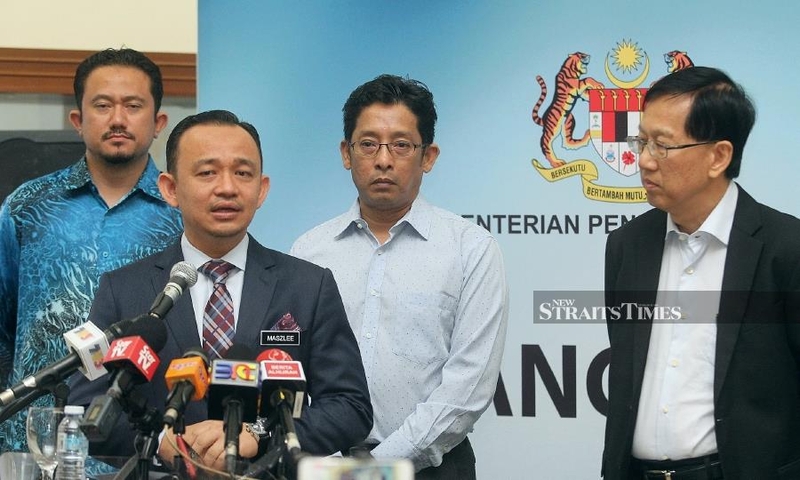 Mohamad Raimi said the process has kicked off a dialogue with regards to current education issues and is very much in line with the ministry’s initiative to reassess the nation’s education policy. “The role of the task force is key to providing a dimension of the national and vernacular education systems in the country. Every student who passes through the education systems goes through an important process where he is able to integrate into a plural society with a single mission and vision and has an understanding of the same citizenship,” he commented, adding that any discussions on UEC should also be viewed in this context. The UEC as a qualification has been accepted at universities in countries such as Singapore, Australia and the United Kingdom. “We will be meeting a few groups — the British Council, for example — to understand this move to recognise UEC at British universities and institutions of higher learning. For a lot of people in those countries, their relationship with China is very important now. And they are beginning to perceive a Chinese education background is of equal standing and quality to allow admissions into universities there. “We have to consider using comparative models on the reason why those countries accept UEC for admissions. Obviously, they see this move as a path in engaging further the fastest growing power in the world,” said Khoo. While there are numbers and statistics of UEC holders at universities abroad, the committee has yet to study the delivery of the teaching and learning process, and pedagogy associated with UEC at schools which Mohamad Raimi feels is important. “There is also a weakness in the UEC system where the mastery of Bahasa Malaysia, for example, is rather weak compared to students in the national education system,” he said. Examinations, he added, are only one final evaluation in the education system. The UEC Task Force will be going to state levels, in particular Melaka and Sarawak, for interviews. “We will have an open townhall with all parties that have been interviewed. The moment you are interviewed, you are a stakeholder. Whatever the outcome, it will have been influenced by everybody there,” said Khoo. He reiterated that there are many surrounding issues when discussing UEC — education and choices, administration and practice, and subliminal matters related to politics, language, national views and even psychology. “The report will be exhaustive and comprehensive, and will uncover the position and climate of the education system along with the dimensions and problems gathered from the interviews. The transcriptions of the interviews will be uploaded and included in the final report. I want the report to be made public but that would be up to the Cabinet,” he added. Mohamad Raimi sees the process as an opportunity for Malaysians to contribute rather than ask how it will all end up. “Share with us your experience of the education process. We are in need of feedback and viewpoints. It not be through interviews, you can also email us to contribute towards a better national consultation,” he said. On whether recognising UEC will open the floodgates to other such requests in future, Khoo has this to say: “One respondent who is a strong supporter of national education and public schools said there will come a time when public universities will have to recognise different qualifications for admission. “But what will the criteria be — the quality and scholarly and intellectual standards? Who will decide and monitor? There are calls for an independent education board and it is a possibility. As we mature as a democracy, more autonomous bodies will come into being to oversee various aspects of our country including the education process. It stands for the Unified Examination Certificate, which is the unified examination for Independent Chinese Secondary Schools in Malaysia. The UEC was established in 1975 by The United Chinese School Committees’ Association of Malaysia (Dong Zong). Among the objectives for this certificate is to act as an overall unified assessment of the Independent Chinese Secondary Schools’ academic performance. It also aims to create favourable conditions for UEC graduates to pursue tertiary studies and employment. WHO ARE THE CANDIDATES OF UEC? This yearly examination is taken by candidates enrolled in more than 60 Independent Chinese Secondary Schools across the country. It is open to all Junior Middle Three and Senior Middle Three students or those who have completed Senior Middle Three secondary education. For this year, 25,298 candidates have been registered. HOW MANY LEVELS OF UEC ARE THERE? There are three levels, namely the Junior Middle Three exams, Senior Middle Three exams and Vocational section exams. WHAT IS THE MEDIUM OF INSTRUCTION FOR UEC? Junior Middle Three: Except for the language papers, all other subjects are in Chinese language. This excludes Sabah, which still has the bilingual (Chinese and English) exam papers for mathematics and science subjects. Senior Middle: Except for language papers, 10 subjects are tested in Chinese and English language. Nine other subjects are tested only in Chinese. Vocational section: Except for language papers, all four other subjects are tested in Chinese. This entry was posted on Wednesday, April 17th, 2019 at 6:55 pm	and is filed under Educational Issues. You can follow any responses to this entry through the RSS 2.0 feed. Both comments and pings are currently closed.